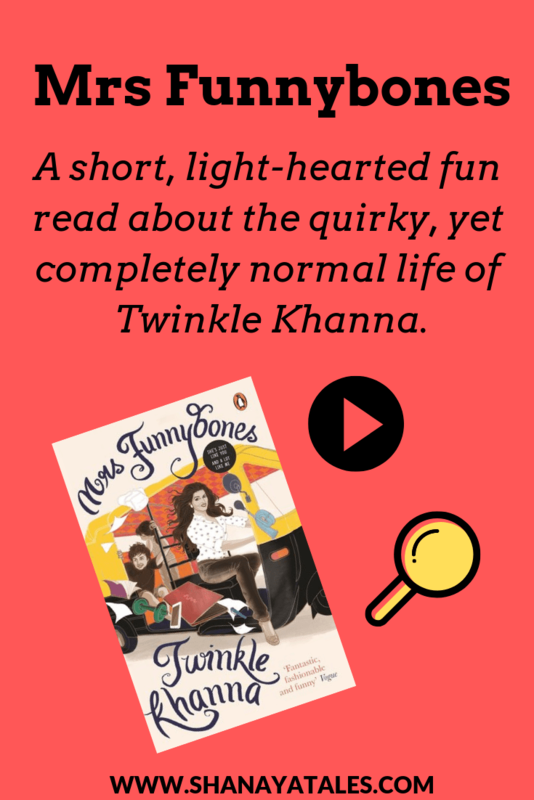 Hiya folks, I am back with a book review, and this time it’s my review of Mrs Funnybones by Twinkle Khanna. 1. I like Twinkle Khanna – nope, not necessarily in a star child/ Page 3 celebrity way, or even as an actress (that clearly wasn’t her strong suit). But I do like her in her columnist avatar; that is my most favorite version of her. I say most favorite version, because she is/has been many things – star-child turned actress turned candle maker turned columnist turned author. Phew! 2. I have a hard time thinking of this as a book – to me, it’s a collection of articles or blog posts or journal entries…maybe. Anything, but not a book. This is not necessarily a good or a bad thing; just my perception of it. Having said that, for the lack of a better description, I’ll stick with ‘book’ for now. 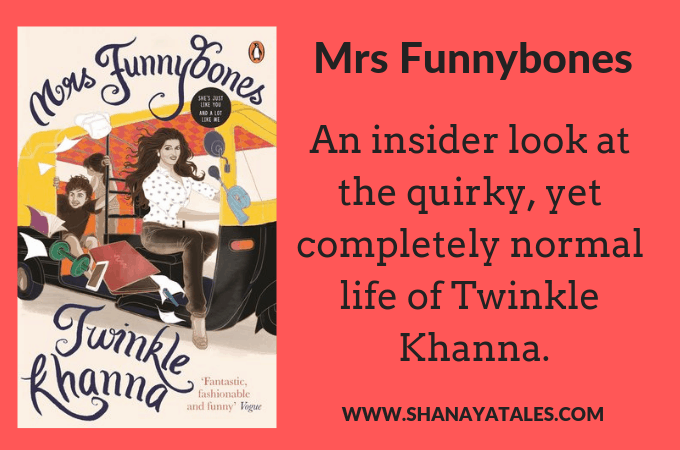 Mrs Funnybones – the book, is narrated by Mrs Funnybones – Twinkle Khanna’s alter-ego (or so she says). I read this book in one-sitting – a feat I haven’t performed in the past few years – not because it is an unputdownable, flawless, literary gem, but only because it is a super fast, quick read. It reads like several journal entries, and is mostly a narration of scattered, unimportant things that happen in her life, which are not exactly interesting, but her ready wit ensures that they are not boring either. I must also mention that this book is not a showcase of the glittering life of a superstar’s wife, if that’s what you are expecting. On the contrary, it is an insider look into the quirky, yet completely normal life of Twinkle Khanna – the mother, wife, daughter and entrepreneur. To be honest, I had big expectations from this book. Mostly because, I have read several of her articles, and have really enjoyed them. She is sassy, sarcastic, and has a great sense of humor, which reflects in her writing. Then came the title, and cover release, and I loved them too. Even after reading the book, I feel that the title and the cover work very well. They stand out, and also convey the mood of the book. Having said what I have said, this book did not quite meet my expectations. Admittedly, the expectations were pretty big to begin with, but it’s not just that. The book is in the genre of humor, and while some segments were genuinely funny, there were also bits where the jokes were cliched, and seemed forced; almost as if the book was trying too hard to be something it’s not. And I mean it – I know that she is better than this! She is way more funnier and wittier on her social media! Also, some chapter headings ( ‘Can Indian men control anything except their wives?’ & ‘Karan Johar celebrates Karvachauth!’) made no sense to me. They stood out, all right, but once I read the chapter, I felt as if they were there just for impact (which okay, works, but only till you actually read the chapter). And finally, there was a (small) section of her writing that did not sit well with me at all – it felt a teeny tiny bit elitist. However, this could just be me, as I am overly sensitive to this. From my extended rant, you may think that I really disliked the book, but it is not so; there was much to love too. But I think above all else, the one thing that stood out to me about this book is how much I could relate to her. I mean, this is Twinkle Khanna – she is born to two very famous film stars, and married to an equally famous one; not someone you would normally think you can identify or empathize with, and yet she pulls it off. There were some parts where she was being her whimsical self, and wasn’t trying to be funny, and those were some of my favorite parts. There were also some segments that were very contemplative; and they truly struck a chord with me. I would definitely recommend this book. It is a light-hearted, fun read. And sometimes we all need a book which helps us to de-stress, and puts a smile on our faces, right? Because that is exactly what this book did for me. *All ratings are subjective, but this one is especially so, because I know she can do much better. That being said, here are some lines/ thoughts from this book that I loved so much, I had to share! Some are funny, some thoughtful..
Our little satellite reached Mars because it was called MOM. If it was called DAD, it would still be circling the Earth, lost, but not willing to ask for directions. As my eyes are shutting, I think about the word ‘love’. It is multilayered, convoluted, and as imperfect as all human emotions. It is not your heart beating fast when you look at him […] or constantly wanting to be with the other person. Love in any relationship, family, or an intimate friendship, is only about putting the other person’s needs ahead of your own, and that, my friend, is just as simple and as complex as you make it. On her experience in a foreign country.. Looking at these old people shuffling along by themselves, all I can say is: We may have potholed roads, but at-least we have many people willing to travel with us on them. That’s all from my end, folks. Have you read Mrs Funnybones? How did you find it? Do you read her columns or follow her on social media? If yes, how do you feel this book compares to her other work? I have gifted this one to many many friends and yet haven’t read it in its entirety. I love the fact that you found it identifiable – that in my mind would be one reason to go buy it. Loved your review, as usual Shantala. Thank you, Tulika. This one is good, the humour falls flat at times, but I guess that is a risk that people take with this genre. Shanaya Tales recently posted…Valentineâs Day for Toddlers! – Why does this exist?! Was eagerly waiting for this review. I am a little disappointed that the book didnt turn out to be as witty as u expected. Nonetheless, i will still pick it up as soon as i get my hands on it. Great review shantala!!! So, here’s a little back story to when the book was released. I think I went on a gifting spree and sent about 10 copies to various friends. Someone had sent it to me as a gift, and I guess I just returned the favour to many others. I enjoyed the book – yes there are cliches and some parts were more ‘ha’ funny than ‘haha’ ones. I’ve been following her columns and yes, the book is sort of a collection of these columns. Or perhaps ones that didn’t make it to the columns. The main reason that I liked it immensely was because I’ve read plenty of so called ‘books’ by Indian celebrities and they were all damp squibs; at least hers made me laugh a fair bit and that to me is a win. And yes, as a parent, lot of those things were relatable too. Having said that, it does have its moments where some of the jokes fall flat. This would make a great gift; for readers and non-readers alike. And yes, those were the moments I was alluding to – the parenting ones struck a chord with me. P.S. I rarely comment on poems too. And when I do, those are some of my most inane comments – even if I liked it (or understood it), I am generally at a loss as to what to say. If I remember right, she did say in one of her interviews that it was a compilation of her columns and bites. I wouldn’t want to judge her writing, but I LOVE her because she’s LIVING each phase of her life the way she loves it at that point in time. Salutes n respects! I have been wanting to pick this book from the day it was released, but one thing or the other has kept me off. I have read many of hr articles and I have been wanting pick this one for the same reason and also because I have read too many positive reviews of the book. Your honest review (that touched on all points I’d love to know about a book) has left me in doubt if I’m going to pick this one soon enough. Nice review. Haven’t decided yet if it will make my to read list but you’ve got me interested in giving it a try. Very fair review Shantala. I read the book almost within a month of its release last year. A good entertainer and a fast read….ideal for inflight reading. Like you said, if you didn’t know it was a book written by such a big celebrity, it might have worked better. It was genuinely funny and one could empathize with many of the situations though I was a bit incredulous about some, considering them happening to someone like her! Rajlakshmi recently posted…When I was TROLLED !! Fair review. I have been thinking of picking up this book for a long time. Worth it I think after reading your review. I haven’t read this but I’m always looking for some non-fiction books to catch my eye. This sounds like something I would like. Typically, over-hyped books dont really match upto expectations. But, Mrs. Funnybones is different and as you said, I liked reading about her life and her witty take on them. I have been following her column and loved the book as well. But, the book does look like it was printed in a hurry to cash in on the initial interest to her columns with some of the chapters repeated from the columns. Lets hope her next books will be funnier. I agree with the she can do better part. When she started publishing her columns, I read them out of curiosity. While she would start off well, somewhere towards the end the exuberance would fizzle out. Nice balanced review of her book. Am sure Twinkle will appreciate the same. P.S. Looks like making books out of articles and posts has become the latest fad. Yeah, that seems to be the trend, especially in celebrity memoirs. Good, balanced review. I think i’ll give it a try!! “Fast, quick read,” OK. Not my kind, I think. Nevertheless, the review is a good one. I kinda had that feeling about this book that it would have a fuzzy, disorganized sort of layout. I’ve been reading quite a few memoirs lately, and that’s one thing common to all of them (except maybe Bossypants or How To Be A Woman) – the chapters are so very… random! I did not know what to expect, but the randomness did not bother me, the cliched jokes kinda did. And I LOVED Bossypants – this would fall really short in comparison. No, haven’t heard of the author or read the book. BUT although it is hard to write funny, I can enjoy the book if it is light reading. I enjoyed a couple of your quotes from the book – the one on love is profound. I loved the quote on love too – simple enough, yet so profound. And yes, writing humour is a difficult task – there is always a risk, but I guess that is also present in any genre that one writes in. I haven’t read the book yet and I am not very regular to her columns. Yes, I remember I read one or two and she is witty with a great narration style. I liked your review and it’s honest. Having heard so much about the book, I now want to get my hands on this one. Hehehe..yeah – she is a way better writer than an actor, but there is still untapped potential in the writer, which we will hopefully see in the future. Shanaya Tales recently posted…Book Blogger Appreciation Week: The Introduction Day! Glad to read your thoughts on this one. I just bought this a couple of months back and was very curious about it. Sounds like it is a mixed bag – some good things and some not so good things in it. Shanaya Tales recently posted…Book Blogger Appreciation Week: The Interview Day! I do wish i had read some of her columns earlier so I would not have been so surprised with this coming on me so suddenly. The book kept me smiling, wincing, chuckling and laughing throughout. I have written a detailed review on my blog widercanvass.blogspot.in. It was fun, wasn’t it? 😀 In my case, I was kinda expecting it, thanks to her columns. Nonetheless, it was an interesting ride.